Our last house was mainly greens and earth tones and white. Springy, maybe. I really liked it, and springy green is my favorite color ever. But the new house is NOT white and it’s going to necessitate venturing out to a new style of decor. How depressing is that? I joke. I AM SOOO EXCITED. 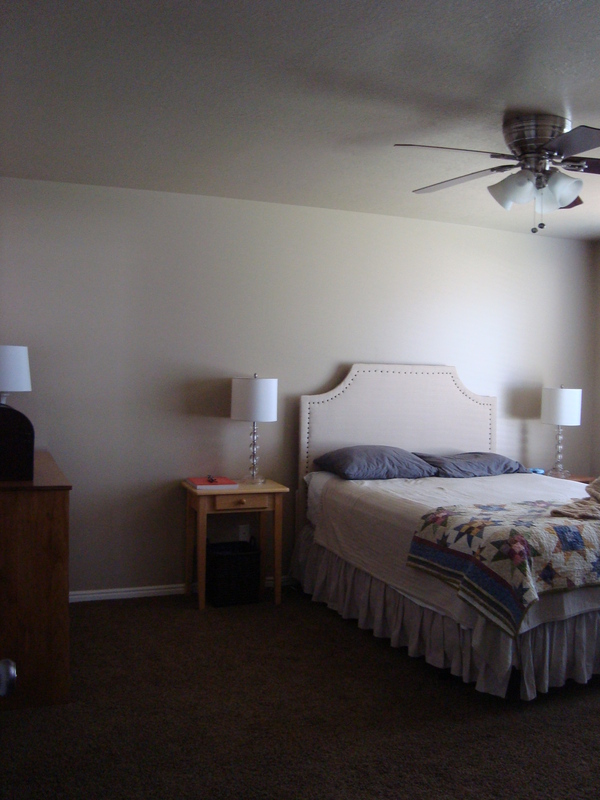 I thought a nice, deep color would make it feel very cozy, and since everything in it is neutral, some color would really help liven up the place. I think I’m going to go with a funky teal, and have been digging up some inspiration. I like this because it’s dramatic and trendy, but still easy and casual. Teal really looks awesome with some yellow accessories. Source. 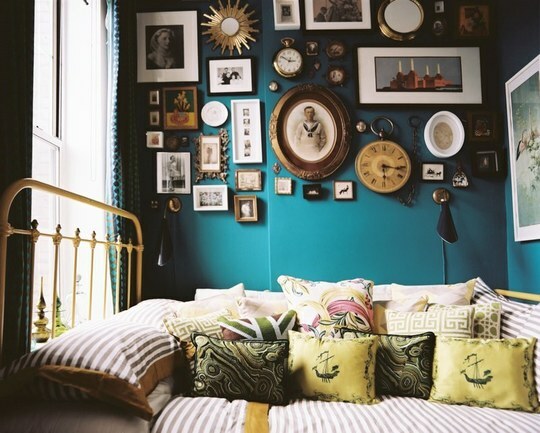 This would take GUTS, but I love it, especially with that chock-full gallery wall and stripey bedding – so fun! Source. This softer version might be nice. No pink, though. Source. 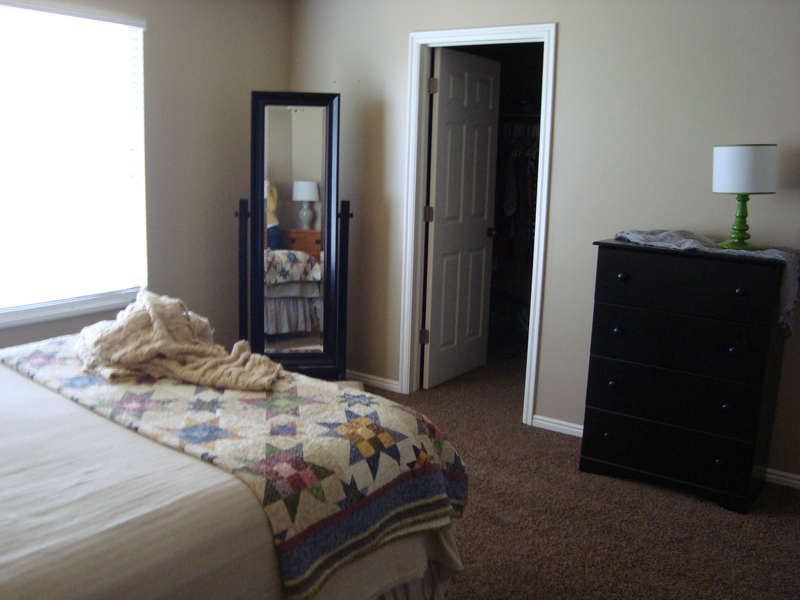 And of course, my favorite bloggers’ new guest room. I love the way they used bright colors to make everything really pop against the dramatic wall color. It’d be easy to switch it out on a whim. Source. What do you guys think? Diggin the teal? I liked the first picture. It looked calming. But anything you do will be beautiful, it always is! I absolutely love teal. 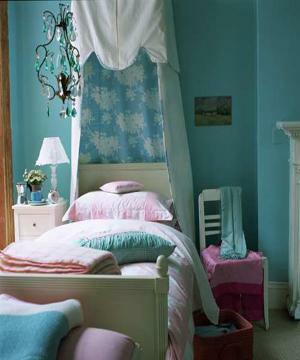 It’s one of my favorite colors and there are tons of bright colors that look great with it.